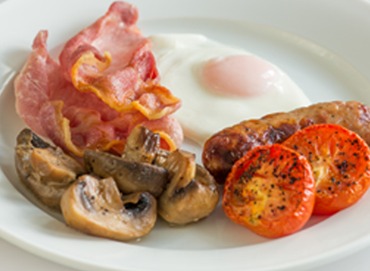 Our breakfasts are made to order, as we like to offer you our local ingredients as fresh as possible and as you fancy them. after a few days in a bed and breakfast, full fry ups can get a bit too filling so we also offer a daily special which changes everyday. We feel it’s was a nice way to offer you something a little different if you fancy it. Specials are made to order too, so choice is the order of the day at Highcliffe. Breakfast in the dining room is between 8.15 am and 9.30am just to order and then you are welcome to stay as long as you like and we’ll just keep topping you up with tea. Ahh the full English. It says “you’re not at work.” It says “you can relax”, it says “you’re on holiday.” It says it all really. And it’s not difficult to know what you’re looking for. You want quality ingredients, choice and someone who can cook a half decent egg. Well that’s what we do. We let you choose what you want in the morning when you know what side of the bed you’ve got out of. We offer you a local sausage from The Kernow Sausage Company who have won 25 awards since they began producing sausages and bacon in 2007 on their farm on The Roseland. We only use eggs which are from happy healthy free range local chickens with space to roam and 24 hour access to sunshine and we can scramble ‘em, fry ‘em, poach ‘em or boil ‘em. Whatever takes your fancy. Toast is delivered daily, organic and hand crafted by Baker Tom’s. When we went to B&B’s, we never got up in time for breakfast because quite frankly we were on holiday! So why not book the Idle Bird option so unlike us, you don’t have to go hungry. All served in a cute English picnic basket. We will gently knock your door and slip a little ‘breakfast is served’ note under your door. If you would like this service please book at least 24 hours in advance.Just email us on info@highcliffefalmouth.com or make a note of it whilst online booking. Idle Bird is unavailable on the day of your departure unless you have pre-booked the Late Check Out. (Late Check Out is noon and incurs a £15.00 supplement). Of course rooms are not cleaned on the morning of your Idle Bird. Well, you’re in bed! Oh no! You mean you have to leave early? Poor you! No problem though, we can still feed you. Book our Early Bird option. A stump teapot with loose leaf Cornish Tea (coffee is already available in your room and is not available with this service). All served very nicely in our wicker picnic basket. If you would like this service please book at least 24 hours in advance. Just email us on info@highcliffefalmouth.com. First thing in the morning you just need a decent coffee and good coffee is exactly what you will get. We serve OlFactory KO beans: Knock Out. It’s not too weak, not too strong and packed with flavour perfect for a wake up call. It’s bean to cup Americano and if you need that extra boom ask for an espresso shot. Choice though is always top of our list so we also offer decaffe Olfactory ground coffee in a caraffe. Tea? Yes of course we do tea. We serve loose leaf Cornish Tea Co Breakfast Tea and Joe’s Tea Co. Ever So English loose leaf Breakfast plus loads of their herbal alternatives. There is another little surprise in store too. Proper freshly squeezed orange juice and proper freshly pressed apple juice. Say no more. You’re on holiday. You should be spoilt for choice. That’s why we offer you a different special every day you’re here with us. And also because we enjoy seeing you struggle with the decision of what to have for breakfast each day.The full English or the Hogs Pudding on Mediterranean toast with a poached duck egg? Mmmm? If you think you could forgo the local sausages in the Full English for our American pancake stack with salty local bacon, bananas & sweet syrup or perhaps the more elegant smoked salmon draped over scrambled local eggs with a toasted muffin oozing with salty Cornish butter then you will love our daily specials. Just coz we’re a B&B does not mean we can’t give you something more than the big, loud, proud full English now does it?